In addition to the welcoming aroma of freshly brewed coffee, we are confronted with display cases featuring the perfect treat for our coffee. To many, this is a luxury we indulge in on occasion. Below I will tell you how easy it is to make some of these treats at home. One of my favorite treats is one made with flaky dough, rolled up with cinnamon sugar. The first bite takes me back to my mother’s kitchen. When baking pies, she would occasionally take the scraps of pie crust dough and make tiny little pinwheels filled with butter, cinnamon and sugar. They were absolutely delicious! With inspiration from my mother and those coffee house treats, I created these Martha White® Cinnamon Sugar Pastries. For convenience, I use the cream cheese dough often used to create little tarts. It’s easy to mix together and filled with buttery cinnamon sugar. The pastries are a treat you will enjoy when lingering over a cup of coffee or visiting with family and friends. 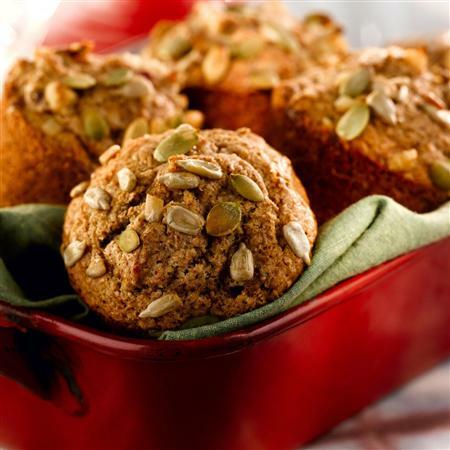 Muffins are also popular and most coffee houses have a bran or whole grain variety to choose from. This Martha White® Loaded Honey Bran Muffin recipe is easy to make with a mix and is full of wheat germ, nuts, dried fruit, and seeds.